Ucluelet, often called Ukee by locals, is a town the west coast of Vancouver Island. In the indigenous Nuu-chah-nulth language Ucluelet means “people of the safe harbour”, and this description tells you much about this stunning place. As you can imagine, there is plenty of waterfront real estate in Ucluelet, but because of its location on the Ucluelet Peninsula even the non-waterfront homes and land are never far from the ocean. Nearby are is the famous Pacific Rim National Park & Barkley Sound. Listing courtesy of 460 Realty. Retail commercial or office space for sale or lease in a waterfront complex. 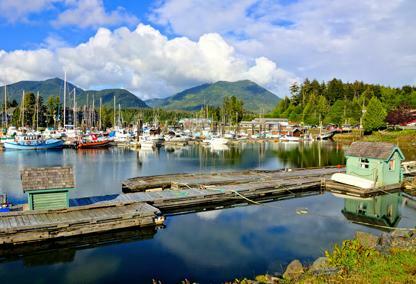 A rapidly developing tourist area in the fishing village of Ucluelet.